While shopping for class supplies the other day - remember all the goodies I showed HERE - I just couldn't resist taking advantage of the great sales and extra discounts that Joann Fabrics was offering, so I purchased a few little treats for myself at the same time. Would you like to see what they are? My biggest splurge was a new Olfa rotary cutting mat at half price plus an extra 10% off! This one is a full 36 inches by 24 inches and I paid just over $22 for it! Whoa boy, do I love a bargain? Of course I do! The other three items were also half price plus an extra 10% off, and all Clover Yo Yo makers! I had purchased one last fall in the Large size just to see how they work, and I just love using it. I even made a video showing how they work in case anyone else might also be curious, or just needed some help. You can see the video HERE. 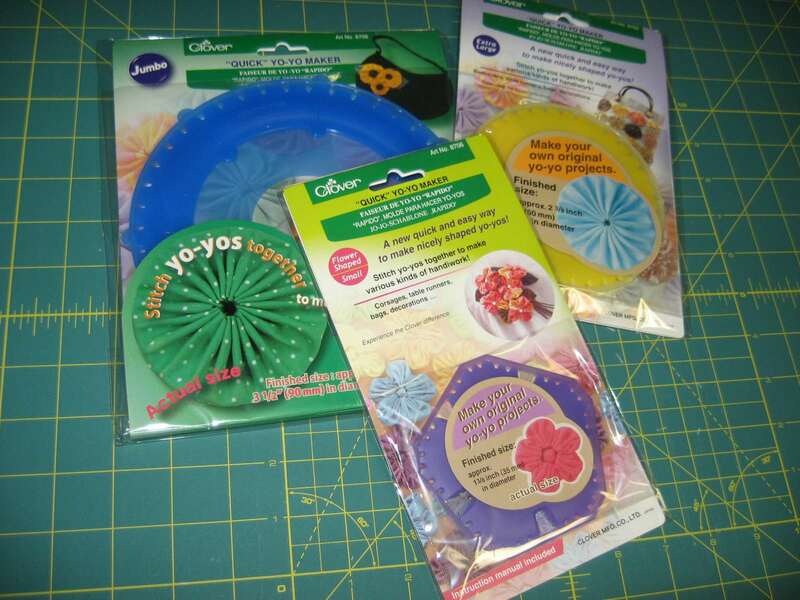 So my three new yo yo makers are the Extra Large size, the JUMBO size and the Flower Shape. Aren't they fun? I can't wait to give them a try! I think I'll bring them to my Upcycling Jeans class at the library and let the kids use them too! I gave my new mat a workout today and this little pile of cuttings is proof that it works just fine! 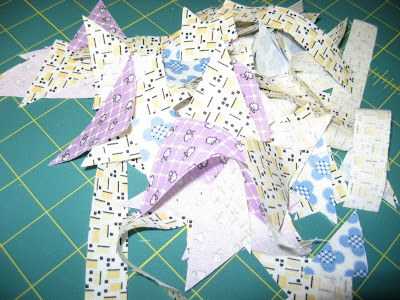 No more little uncut sections of fabric from using my very very old mat! I'll show you what I'm making here once they are finished. Do you recognize that fabric? Yep, it's more of that wonderful Mama's Cottons from Connecting Threads! Just like what I used in the sewing kit I'm giving away on Friday. Be sure to sign up HERE for a chance to win it or a pretty little fabric biscornu pin cushion that I also made! 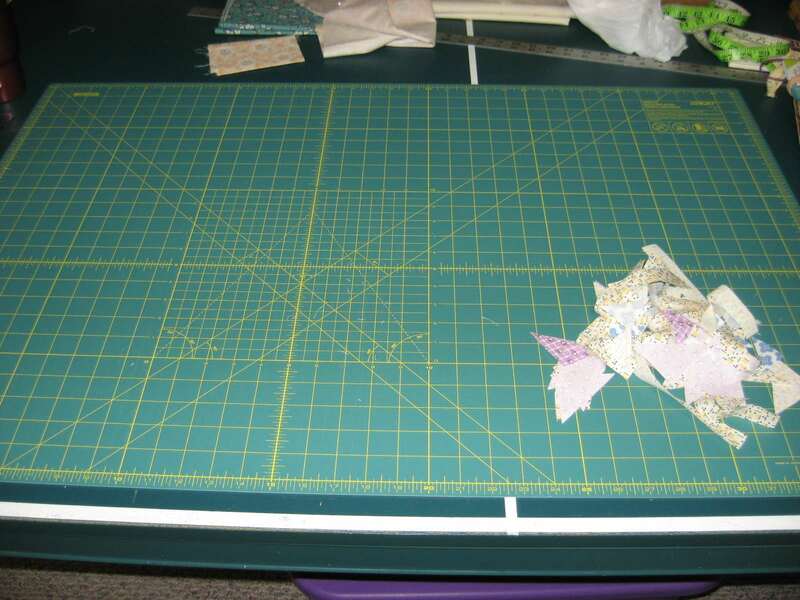 Now here's my question for those of you who have stayed with me this far...have you ever noticed an odor emanating from a new cutting mat? This one smells really really bad, and it's making my whole basement and sewing room smell bad too. It's a rubber kind of smell and it's nasty. I thought about leaving it outside for a few days to air out, but it is so darn hot and humid here this week that I think it might actually melt! If you have any suggestions that might help, short of putting a clothes pin on my nose, I would love to hear them. I have already tried rubbing it all over with a dryer sheet. That just made the dryer sheet stinky too. It was worth a try. I love those yoyo makers. I have a few sizes myself. I watched your video on the yo yo maker, and you did such a complete and detailed job. thank you! Your voice is very soothing, by the way. I will say becasue of all the fat quarters I cut, I use a lot of mats, none of them have smelled, I would take it back for a new one. Yes Mary grace I would return it for another one.never heard of a smelly mat before. I do recall a quilting pal having a cutting mat that smelled REALLY bad and it took a very long time for the smell to go away. Nothing she did seemed to help....except TIME. I just searched online and found where someone said they soaked their smelly mat in the bathtub with water and vinegar for 10 minutes......and then dried it off and soaked it again for another 10 minutes (not sure how soon after the first soaking) and after the second time, the odor was nearly gone. Maybe that is worth a try.